Browning Recon Force FHD gaming camera never fails to boost itself with its compact design and durable hardware. Waving the banner of its pride a 10 megapixels image resolution along with the attached 30 IR LED that provides illumination that gives you a good a quality of images most especially during daytime. It is being enhanced on par with the Strike Force 850. It also features Zero Blur technology that gives maximum quality images and video quality of 1920×1080 HD resolutions that allows preview and playback of video clips even on 60 inches screen without risking the quality of its outputs and has the fast speed of 0.67 seconds trigger. The strap and python cable bracket on the back is metal unlike another camera that uses plastic, and it has a threaded slot on the bottom. Also, the battery compartment and SD card slot are both easily accessible. Browning Recon Force could store thousands of pictures as it supports up to 32 GB SD card. It’s a camera that works both for trail hunting and home security. It also provides ID stamp on its pictures such as the temperature, date, time and moon phase. This device also has its speaker and a 12V auxiliary power port that is located on the bottom. It can be mounted everywhere else you wanted to, since the rear housing features of this device clasp to hold grip onto trees, loops as it entails a mounting strap, a padlock hole and extra holes for a Python security cable. Moreover, the built-in cover latches need an extra force to unlatch, and the noise of the suction silicone rubber gasket will indicate as soon as you reached the opening of the camera. Browning Recon Force FHD gaming camera is armed with robust metalwork that can withstand rough environment condition, and its quality gasket will serve as its shield that keeps the moisture away. Also for double protection, the power port is covered with rubber silicone to prevent moisture accumulation. It only needs 8 AA lithium-ion batteries to operate. To load the batteries you will need to push the Eject button located at the top, and the battery compartment will automatically slide on the bottom. Detection Circuit- This device has a maximum detection circuit and has a fast trigger speed time of 0.67 seconds. It has a smart IR video detection system that allows the camera to continue recording the video for up to 5 minutes during daytime and up to 20 seconds at night, as long as the game remains to move in a detection zone. Zero Blur- It has a unique technology that promotes zero blurs to produce vivid pictures and high definition videos. It can record videos with sounds and has its 12V auxiliary power port. Nighttime Flash- The 100 feet flash range enables it to get the extreme amount of details during nighttime despite the light condition. The mechanics of the camera itself are very well made and will do wonders for those that use it correctly. Durability- This camera is rugged to withstand water and forcible weather conditions. It works at its best even if it is in the midst of the wild environment. It has double protection because of the rubber silicone covering attached to it. The quality gasket serves as its water repellant to prevent accumulation of moisture. Connectivity- It allows preview and review of images and videos using full TV screens or personal computers without pixelation of photos. Battery Life- Since it only needs up to 8 pieces of AA batteries; it would not last for more extended periods and thus requires the user to have extra batteries ready to keep the camera function. Its battery life varies with the operating temperature and the number of photos taken over a period. Compatibility- SD cards are not included in the package, and unfortunately, it is not compatible with all types of SD cards. Although the manufacturer recommended SD card brands that are suitable for this device and it is indicated in its user manual. False Triggers- This device is so sensitive. It is triggered even by the things out of the frame or also changing shadows on the ground. It can detect even the slightest movement, and it can consume its battery life for nothing. Browning Recon Force FHD gaming camera is built with the dimensions of 5 x 4 x 2.5 inches that weigh 1.4 pounds. 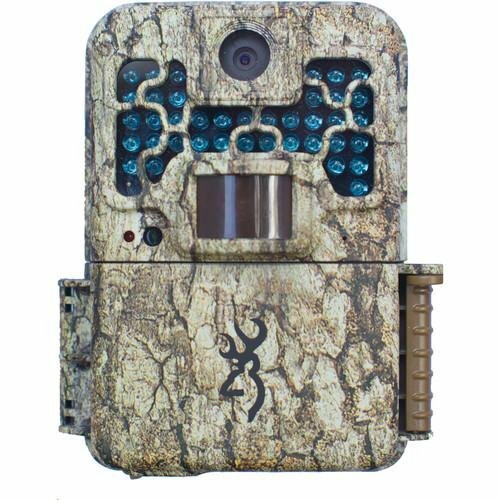 That includes Browning Buck watch time-lapse viewer software that allows the user to see patterns during the coverage. Featuring the zero blur technology that makes it more distinct than the other gaming cameras it also requires 8 AA lithium-ion batteries to operate. It records video up to 5.0 seconds to 2.0 minutes. It has time-lapse shooting mode that can capture images at pre-set intervals from sunrise to sunset. It is configured with a TV-Out connector for viewing on your television and a USB port for image transfer to your computer. This is best for those hunters who wished for another set of eyes for an extension during game hunting and wildlife experience. It is also recommended for those who are looking for an easy setup home surveillance security camera that functions 24/7 even during harsh weather conditions and is water resistant. Put the Browning Recon Force FHD gaming camera to work with you and make your scouting and game trails full excitement. Also feel free to enjoy and be rewarded with high-quality images and high definition resolution videos during hunting season. It is recommended for both wildlife and gaming or serves as additional security at home. Let this device spice up your wildlife and hunting experience.